Decision to shut down 19 Eutelsat channels draws Tehran's ire. 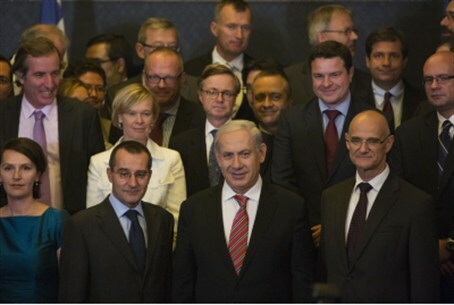 Netanyahu commends new EU sanctions. Iran is upset over the European Union's decision to shut down all 19 Iranian satellite channels carried by Eutelsat, including Press TV and the Al-Alam channel in Arabic. Iran's satellite channels carried a statement Tuesday denouncing the decision as a violation of freedom of speech and freedom of expression, Voice of Israel public radio said. Prime Minister Binyamin Netanyahu met with European Union member state ambassadors Tuesday and commended the EU for the sanctions package it approved Monday against Iran. "I first want to congratulate the EU for receiving the Nobel Peace Prize," he said. "Would that we could replicate in the Middle East what was achieved in Europe. That is, decades of stability and peace and tranquility. That is our goal and we'll discuss how we can advance that goal, that all Israelis share fervently. "But especially today I want to commend the EU for the tough sanctions that were adopted yesterday against the greatest threat to peace in our time, and that is the tough sanctions against Iran. "These sanctions are hitting the Iranian economy hard, [but] they haven’t yet rolled back the Iranian program," he added. "We'll know that they're achieving their goal when the centrifuges stop spinning and when the Iranian nuclear program is rolled back. And I think that this is a goal that is shared by anyone who wants to guarantee the security and peace of the world, not only in the Middle East, but throughout the world. So these are momentous issues, momentous times, and it's time to continue discussing them." The new punitive package, which includes an embargo on Iranian natural gas, was agreed upon at the EU foreign affairs council in Luxembourg on Monday. It aims to close major loopholes that allow Iran to circumvent existing sanctions. The new measures ban any dealing with Iran’s banks above a pre-set, relatively low threshold, except for some areas of medical and humanitarian aid.